There TIPA was, stand 11, at the 2017 World Efficiency Conference in Paris, France. As a Marcom Associate, I had the opportunity to represent TIPA amongst a diverse group of awe-inspiring, and innovative companies working to solidify a more sustainable future. To my right, a stand promoting renewable energy via algae production, and to my left, I was joined by a sustainable, organic tile company – all joining forces in what was referred to as the ‘Startup Village’! The idea behind the World Efficiency Conference – held from December 12th – 14th – enables a powerful, matchmaking platform that links sustainable awareness with a healthy side of showcasing new technologies, training and potential investor relations. 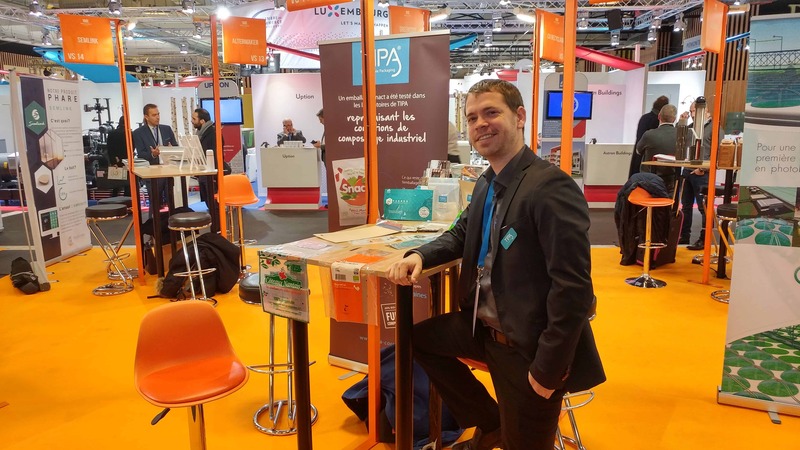 The World Efficiency conference also allows journalists, government officials and NGOS alike to see what the European market is doing to reduce the flexible packaging waste epidemic. I had a chance to present TIPA by first taking a moment to highlight a global issue concerning recycling single-use plastic packaging; not only because of the various polymers that make up the different types of plastics, but also the variation of types can in-turn be less cost-effective, and a good reason for companies to cheaply produce new plastic instead of recycling what can be/has been collected. But all hope is not lost. Our aim for the audience of the World Efficiency conference was to spark a feeling of optimism for the future of plastics. Along with TIPA, there is recent yet crucial development in the science and technology of biopolymers, or the material that makes up plastics, and it’s leading to easier end-of-life solutions for flexible plastic packaging. In addition to my presentation, TIPA’s table in the Startup Village had samples of its full compostable packaging materials on display – from Snact in the United Kingdom to Karma in Ireland, Meesters Van Der Halm in The Netherlands, Udea and Ekoplaza from The Benelux, and YogaLyte, Sheffa Foods, Reuseit and B.O.S.S Food Company’s products from the United States. In between the waves of curious and questioning attendees around the TIPA table, I had a chance to meet Mrs Brune Poirson, the French Secretary of State to the Minister of Ecological and Solidarity Transition. Our meeting wasn’t until the end of the conference, but my conversation with her was enlightening in understanding the viable potential bioplastics have in the future European market, including areas of improvement. In the end, my time interacting and presenting at the World Efficiency conference was a mutual feeling of optimism. My conversation with the minister safeguarded TIPA’s ongoing support in the continuing effort of sustainable packaging within the French government, and France as a nation, as well as a feeling that with joint effort, change is possible.